It was a breezy spring morning, and I decided to check out Terrain with my little guy. I have driven by this place more times than I can count, but after seeing a few photos of the store on Pinterest, I knew I had see see it for myself. The only way I can describe it: a true feast for the senses. What is Terrain? It's a little bit of everything... store, garden center, cafe, boutique, private event venue. It's a little hard to explain, so I thought you might like to watch their video from Vimeo. Something about this place makes me feel happy. And, apparently, my son agrees. Upon arrival at Terrain, my son walked along an old log in the parking lot. Once inside, he made funny faces in an oversized mirror. His little hands felt the different types of cacti. He was completely captivated by the water fountains that were scattered throughout the store. He frolicked around the outdoor garden center and smelled the flowers. 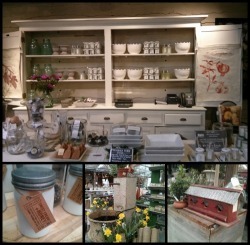 There were so many cool things to buy at Terrain and many of their products were made in the USA, which is fantastic! If you don't live near their stores in PA or CT they have an online shop with such unique home, outdoor living, jewelry, accessories, and garden products. Plus, they currently have a promo code FORMOM so you can get free shipping on all orders over $100. 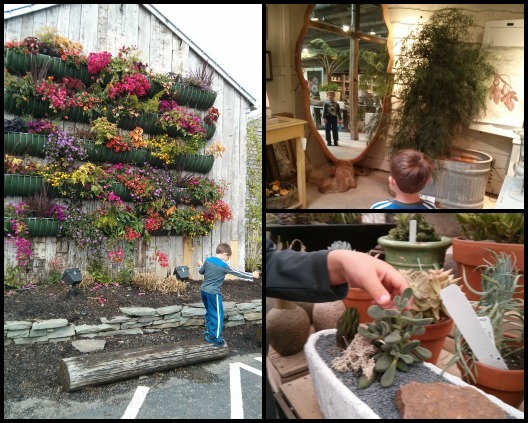 I hope you liked hearing about our first visit to Terrain. I know this won't be our last visit, and I'm looking forward to attending one of their many in-store events. Have you discovered any local treasures lately? Video Credit: Terrain at Glen Mills, PA from Terrain on Vimeo.